This impressive and vibrant meal comes together surprisngly quick thanks to the power of the grill and the power of spatchcocking. If you've never tried it before, spatchcocking is a technique that refers to removing the bird's back bone so that you can butterfly the whole chicken open. This technique is a guaranteed route to succulent meat, ultra-crispy skin, and a much quicker cooking time. An herb-packed chimichurri sauce makes this meat-and-potatoes main vibrant and exciting. Double the mixture and spoon it over grilled steak or fish on another night. For less heat in both the chimichurri and the potatoes, remove the seeds from the Fresno chile. In Mexico and Cuba, cooks marinate chicken in a mixture of cumin, oregano, garlic, and citrus to make it juicy and flavorful. Adding achiote paste, as cooks do in Mexico, adds depth and sweetness, but the chicken is good without it too. Wine pairing: Martin Ray 2014 Puccioni Vineyard Zinfandel (Dry Creek Valley). The secret to extra moist grilled chicken is an overnight soak in a hot sauce-laced buttermilk marinade. We love this live-fire version of a recipe from our archives because it gives camp chicken a complex flavor with minimal ingredients. Drizzle a Tangy Strawberry Barbecue Sauce over this plate for the ultimate summery chicken dish. Simmer the chicken ahead of time so that all it needs is a few minutes on the grill. Squeeze the soft, juicy grilled lemons over the meat, or cut the lemons into pieces to eat skin and all. Season grilled chicken thighs with a Mediterranean spice blend called zaatar that's composed of sesame seeds, thyme, marjoram and sumac. Look for it in the spice section of your supermarket or in a Middle Eastern market. The sweetness of maple syrup and the tartness of two kinds of mustards create an amazing flavor combination for these grilled chicken thighs. Pollo al mattone (chicken grilled under a brick) is one of Italy's great gifts to global barbecue. The weight of the brick gives the chicken a crisp, compact texture. 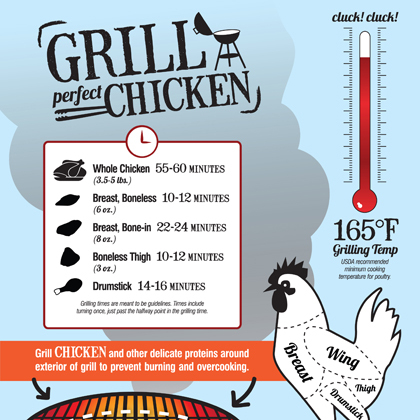 If you love the traditional version, wait until you taste it grilled under a salt slab, which seasons the chicken while it cooks. Instead of the usual barbecue sauce, brush bone-in chicken leg quarters with a sweet and spicy glaze made with hot chile sauce and mango jam for a great grilled chicken recipe. Cook the chicken over indirect heat so the glaze won't burn. For a great tasting weeknight dinner with lots of bold flavor, try Jerk Chicken and Stuffed Mini Bell Peppers. The mini bell peppers will be a big hit, and the creamy filling will help tame the heat of the jerk chicken. No Summer cookout is complete without these crispy, delicious wings. Be sure to serve with a delicious sauce to complete the experience. Bring the Caribbean's heat and spice to your dinner table by basting the chicken with jerk sauce, beer, ketchup, and hot sauce. You only use a small portion of the beer in the sauce, so enjoy the rest with dinner. This recipe garners nothing but rave reviews! The easy Honey-Chipotle BBQ Sauce seals the deal. Bright, citrusy chicken is paired with a salad of baby heirloom tomatoes and feta cheese. This fresh, healthy meal is on the table in 30 minutes or less, making it the perfect excuse to fire up the grill (or grill pan) on a weeknight. Soak chicken in a citrus-and-tequila-spiked brine to infuse Latin flavors and keep the chicken moist as it cooks. 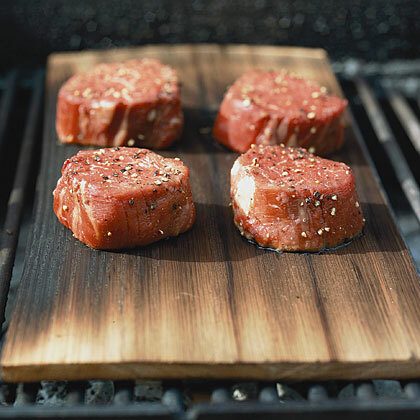 Pat the skin dry before grilling, and start skin-side down to ensure it gets good and crispy. Traditional jerk recipes have you marinate the meat for a day or more. This dish lends huge flavor to the chicken with just an hour-long marinade. These chicken thighs are everything you're looking for when you hit the grill. Use amber agave syrup when making the glaze for a deeper flavor than the more light-colored varieties offer. Instead of soaking the chicken in a saltwater mixture to add flavor and juiciness (brining), this chicken is brined in a mixture of buttermilk, shallot, and spices. The chicken can soak in the brine a day ahead. A light lemony dressing plus crumbles of salty feta transform packaged rice into an elegant side dish. Dinner guests are guaranteed to be impressed with this deceptively easy Pulled Chicken Sandwich recipe, which includes a seven-ingredient rub and a simple 15-minute sauce that comes together while the chicken grills. A classic Italian pairing of orange and fennel livens up basic chicken. The sauce turns into a light glaze when brushed on the chicken at the end, but could also work as a marinade if you have time (chill overnight). The marinade for the chicken also serves as the dressing for the salad in this easy recipe for Spicy Grilled Chicken Thighs with Cucumber-Radish Salad. Pop open a cold one for juicy, tender grilled chicken. Use your favorite beer to make this crowd-pleasing recipe for your next backyard barbecue. Paillards are simply pieces of meat or chicken pounded into thin pieces. Because you have more surface area, you can use more of the citrus-herb rub, and the grilling time is only about 5 to 6 minutes. Online reviewers love this recipe because it's "simple and delish!" When you marinate a whole chicken overnight in a buttermilk-herb mixture, then grill it slowly over indirect heat, you're adding a double dose of flavor. A different take on the traditional "beer can chicken," this chicken is best served with a ginger ale glaze. Online reviewers claim that these honey-and-mustard-marinated thighs are definitely "company-worthy." Serving them over cheese grits and sautéed spinach makes this grilled chicken dish extraordinary. This chicken is wonderfully moist, with a smoky sauce that will have you firing up the grill year-round. This twist on the traditional Asian chicken dish has a very unique flavor, largely due to the use of peanut butter cups as the central flavoring agent. That's right, we created a rich sauce using a blend of soy, rice wine vinegar, seasonings, and chocolate-peanut butter cups.